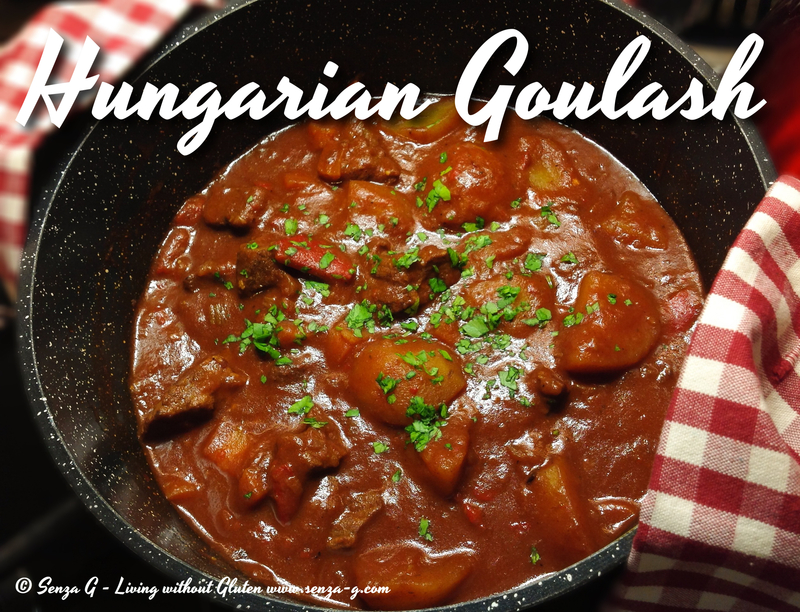 No stew can be easier to make than this Hungarian Goulash! Lovely chunky pieces of meat and vegetables slowly cooked in a paprika and tomato sauce! You can serve this either on its own with fresh home made crusty GF bread, plain rice or else with buttered GF tagliatelle. Put the flour in a freezer bag and season with salt and pepper. Add the beef cubes and shake to coat with flour. Set aside. In a large pot, heat some olive oil and sauté the onions. Add the meat and brown on all sides, stirring all the while. Throw in the celery, carrots, peppers, garlic, ground or crushed caraway seeds, both types of paprika, tomato paste and potatoes and sauté over medium heat for a few minutes. Add the red wine, followed by the Passata and stock, mixing well. The meat and vegetables should be almost covered by the liquid. Season. Bring to a boil, then reduce the heat and leave to cook slowly until the meat is tender.